Welcome on board of the Enterprise! It seems that Star Trek slot has plenty of advantages. First of all, it has nice graphics. Secondly, the rules are pretty simple - you have 5 reels, 30 paylines and 4 bonus rounds. And, finally, certain bonuses can bring you up to 250 free spins! 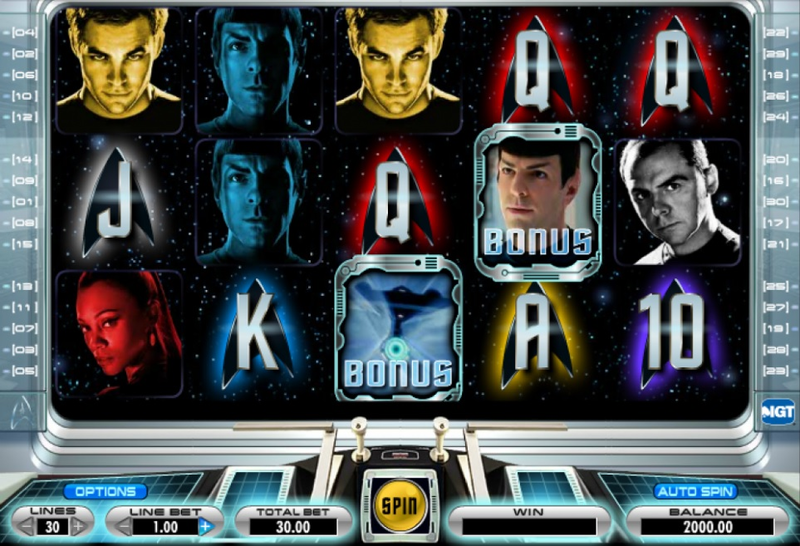 Star Trek slot was designed and released by IGT. It has 5 reels and 30 paylines. The paytable looks like you are sitting by the window of Enterprise and looking at beautiful stars. And, obviously, symbols. Otherwise this game will have no sense. The wild symbol is the logo of Star Trek. The Scatter looks like a jump into warp. Yeah, fans of Star Trek will understand this, but if you are not keen on this universe - look for a symbol with the word “Bonus”. Found it? So, this is the scatter icon. Okay, let’s review Star Trek slot in greater detail. As usually, the wild symbol can replace any other icon. The Scatters are used for triggering the bonus features. You need to collect two of them plus the movie character symbol. “There are four characters taking part in this game, therefore, you can get one of four different bonuses”. So, let’s start with Captain Kirk’s bonus. This guy will give you from 3 to 6 free spins and triple your winnings. Remember, captain allows you to spin until you win. For instance, the first spin brings you no winnings. But don’t worry! Just spin again, and keep spinning until you get a nice winning combination. There is nothing perfect in this world - the limit for this bonus is 250 spins. The next bonus is offered by Dr Spock. You get from 10 to 15 free spins, and winnings achieved with Kirk symbols will bring you two times more than during the main game. There is also another special symbol taking part in this bonus - Spock Wild. It appears on the second, the third, the fourth and the fifth reels. The third bonus option is offered by Lieutenant Uhura. If you get it, you receive from 6 to 12 free spins. Moreover, special scatter symbols will increase your winnings (you get 2 coins for 3 icons, and 250 - for 8), while the usual ones will pay you 3 times the total bet and help you to get more free spins. But not more than 250! And here is the last bonus you may get on this slot - Scotty’s bonus. You receive 10 free spins and begin with x2 - x5 multiplier value. After the first five spins this value turns into x4 - x10. And again, the Scatters will bring you 3 times the total bet and more free spins. The limit for spins is the same - 250. Star Trek slot can be kind of entertaining, especially if you like the movies about that cool starship, Enterprise. The game has an eye-catching design and offers several bonuses, which can result into nice winnings. You may even get a jackpot here. It’s 1000 coins, and this winning can be yours, but only in case you manage to collect 5 symbols of Captain Kirk in an active payline. Wanna try? Then click here.